Enhle Gebashe. (Photo: Fani Mahuntsi). Like many little girls she’s always loved fairy-tale princesses and dressing up in flowing gowns similar to those worn by the heroines she’s admired in books and on screen. Yet Enhle Gebashe’s fascination went deeper than just playing dress-up. She’d stare at the garments worn by the princesses and think about how she could recreate them – preferably with a dash of African print that would really make them pop. And so the 10-year-old started sketching her version of African-inspired outfits that would make every little girl feel like a princess –which is how her business came about. The young designer now runs Enhle Babes Couture, a children’s brand specialising in glamourous African-print outfits. 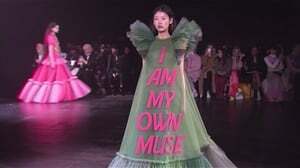 In October 2018 her mom, Desiree, 33, started a Facebook page advertising her daughter’s designs and things are picking up. Orders are increasing, Desiree says, as word of Enhle’s designs spreads further. Enhle, who caters for kids between the ages of four and 12, has been into fashion for “a long time”, she says. “When I was two I used to choose my own clothes and when my mom went fabric shopping I’d go with her and pick patterns I liked. The talented little designer, who started Grade 6 at Rosebank Primary School in Joburg this year, lives in Melrose North with her mom, dad Nduduzo, 33 – a graphic designer and electrician – and little brother Njabulo, 5. Desiree, who’s a social worker, doubles as both seamstress and manager to her daughter and says she isn’t surprised Enhle has found a measure of success so soon. “I kept postponing this dream of hers because I thought she was too young,” she says. But Desiree eventually gave in when she realised how happy it would make her child. Enhle’s budding business has also helped her cope with schoolyard bullies, her mom tells us. “She’d come home from school depressed and I knew something was wrong because she’s usually a very bubbly child,” Desiree recalls. Enhle confessed there was a boy and some girls who terrorised her but things have changed for her at school now. She’s a top achiever and counts English, maths and science among her favourite subjects. Right now she’s torn between being a scientist and a designer when she grows up – it’s her dream to one day create a gown for Generations: The Legacy actress Pearl Monama. But at the moment Enhle Babes Couture is taking up most of her free time. Initially she negotiated with her mother that they sell the clothes at a local flea market on Sundays, with the Facebook page acting as advertising for those interested in buying. But the social media account attracted so much attention the mom and daughter pair are now selling their creations via online orders only. Desiree has had to teach her daughter about the importance of responsibility now she’s a budding entrepreneur. “It’s very hard to find a balance because sometimes she wants to play a TV game with her brother or watch a science show but she’s got sketches to do. being an all-rounder. 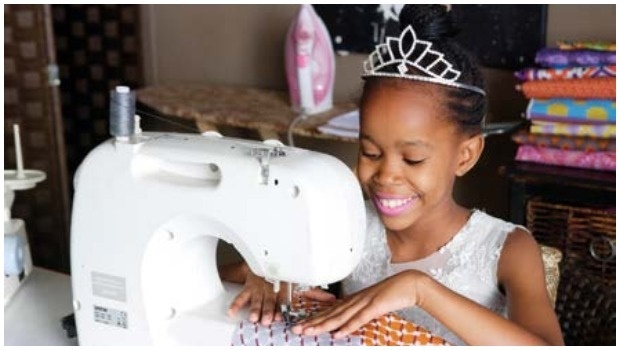 She’s started learning how to operate a sewing machine and this year she will be spending her Saturdays at a fashion school in Joburg after receiving a scholarship from the school to further her dream there. Although she’s fairly strict about Enhle meeting her orders, Desiree wants to make sure her daughter still enjoys being a child. Enhle and her brother do everything together, Desiree says, and has nothing but praise for the way her daughter handles herself – although she is a “typical child” and doesn’t always listen to her parents, she adds jokingly while Enhle looks away in embarrassment. Enhle says she hopes to open her own clothing shop one day – if she doesn’t go the science route, that is. She enjoys running the fledgling design business with her mom and Desiree also wants to teach her daughter about the financial side of business. She’s asked a close friend, Wits lecturer and entrepreneur Thulile Khanyile, to mentor Enhle on managing the money side of things. Enhle Babes Couture is selling 20 to 25 outfits per month at the moment, at R150 to R200 each. Desiree is determined the money won’t just be frittered away. Enhle has also started branching out into other revenue streams. “She’s planning to hold high tea events for little princesses – I often take her out for high tea when it’s our quality time and she’s always enjoyed it,” Desiree says. While she’s enjoying helping her child with her design endeavour, she admits her dream for Enhle is still to become a scientist.